An up-close image of the Sparkling Peach Jelly Sake Shot at SuGa. 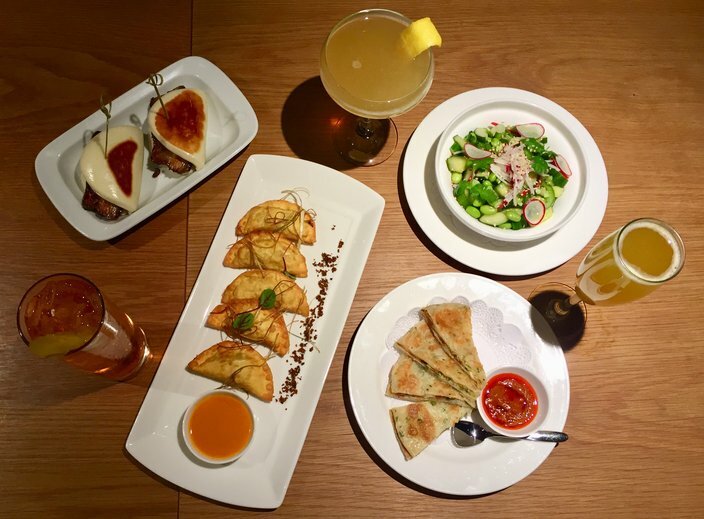 Modern Chinese restaurant SuGa, led by acclaimed Philadelphia Chef Susanna Foo and her son, Gabe Foo, recently launched a new happy hour menu. Susanna took flavors and favorites from both her childhood and her travels and gave them non-traditional twists. To eat, there are dishes like the Popcorn Pork Ravioli, Scallion Pancake and Curried Chicken Dumpling. 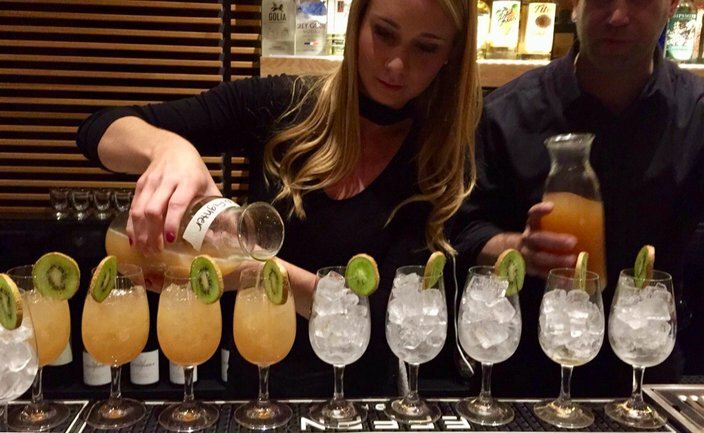 Cocktails use ingredients like raw honey, Jasmine tea-infused gin and coconut-infused sake. All the drinks and (surprisingly large) bites are $3-$7. While all are inventive, there's one item on the happy hour menu that really stands out. 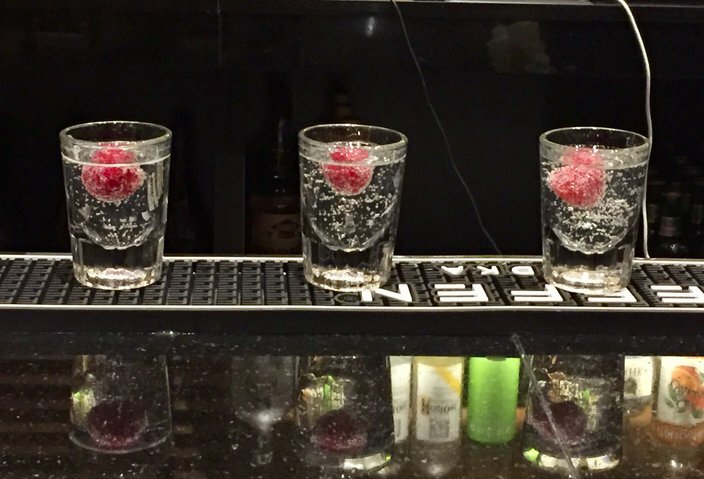 It's a sake shot that "pours like a liquid, tastes like a solid." 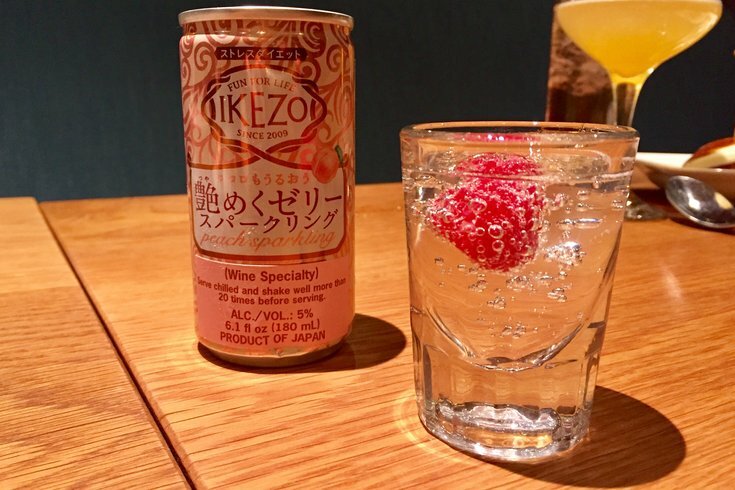 The sparkling peach sake from Ikezo looks like water when poured out of the can, but has a jello shot consistency. SuGa is the only restaurant in Philly that serves the Japanese import. Below are more photos of the new happy hour items at SuGa, which opened on Sansom Street early last year. Happy hour runs 5-7 p.m. daily. The Spicy English Cucumber and Tongpo Pork Bao are other happy hour bites. The Good-Natured Gabe and the Sparkling Susanna are cocktails that are also on the menu. 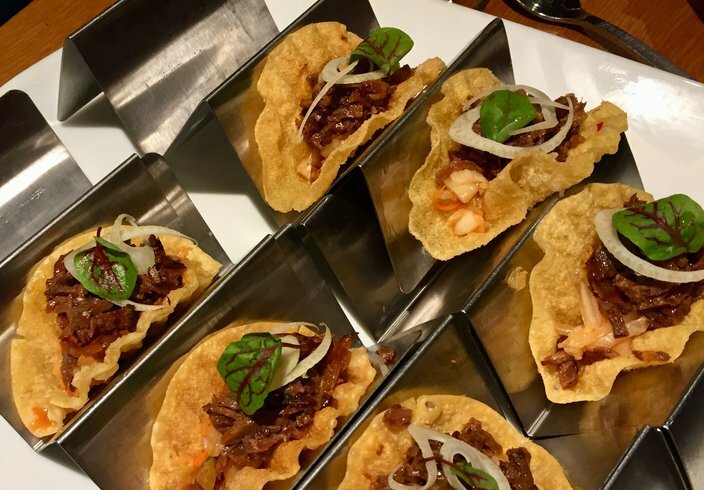 The Sichuan Beef Taco is made with spicy beef, kimchi and coriander. A bartender at SuGa pours the Foo Fighter cocktail. It's made with coconut-infused sake, house-made kaffir lime rum and lime juice.